Born and bred on the Points of Noosa Heads, Australia, Josh Constable has been surfing all his life and competing for the past 20 years. To date he has a World Title, 6 Australian Titles and some 51 career titles under his belt. Having worked along side some of the best shapers in the industry, Josh’s Brand, Creative Army, is a kaleidoscope of all his experiences, waves and relationships – a voice for his story through Creative Army’s designs, lines and shapes. Creative Army reflects Josh’s belief in keeping it pure and to the highest standard. 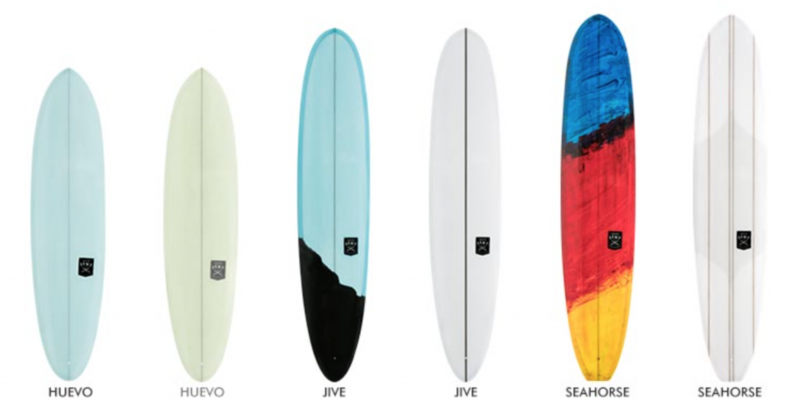 All boards are inspired by traditional templates, but made with the modern surfer in mind. With a contemporary fashion palette, they are made to make the beginner surf better and the most advance push themselves to their limit. Find out more about Creative Army Designer Josh Constable. The Seahorse, is a stylish old skool, single fin Longboard. This board is about forgetting about today’s crazy surfboard designs and getting back to simpler times and shapes. It has a full template, low rocker and soft rails. Made for endless nose rides and fluid turns. Its low rocker will get you through those hard to make sections and the soft rails are easily re-set to get in the sweet spot. It works well in small to mid-size waves in clean faces. A blast from the past that any Longboard surfer will enjoy in their quiver! OUTLINE: The traditional outline with wider nose wider chopped square tail makes for that classic 60’s looking board. ROCKER: With emphasis on trimming and nose riding, the Seahorse has a low rocker through the front and midsection for that trim and speed while driving through sections on the nose. While its flip tail rocker helps pull you back into the pocket for endless time on the nose. CONTOURS: Subtle yet effective, the deep concave in the nose creates crazy lift while perching on the nose . Its flatter midsection creates speed and trim and the slight rolled Vee through the back half makes for ease of rail to rail transitions to set up for you next trip to the tip. PERFORMANCE: This is a great classic style board for those smaller to mid size days where you want to flow , trim , turn and nose ride . A perfect board for any surfer to take their surfing to the next level. Enjoy!